This amazing combo includes three complete meals plus dessert to express your condolences! 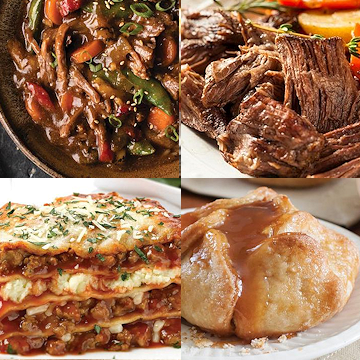 You'll get a juicy, flavorful fully cooked pot roast ready to heat and eat, an authentic lasagna made with best USDA beef. and a slower cooker meal with meat and vegetables. This exceptional combo also includes an all-new slower cooker Steak Diane Skillet Meal. Starts with braised beef steak strip seasoned to mouth-watering perfection, earthy asparagus, pearl onions, and juicy mushrooms for texture. Simply sauté it all in your favorite skillet and then pour on the sumptuous sauce of cream, Worcestershire, real French brandy, butter, and Dijon mustard. With notes of lemon and balsamic vinegar to complete the richness, it's the perfect weeknight luxury. CONTAINS: MILK AND FISH (ANCHOVIES).